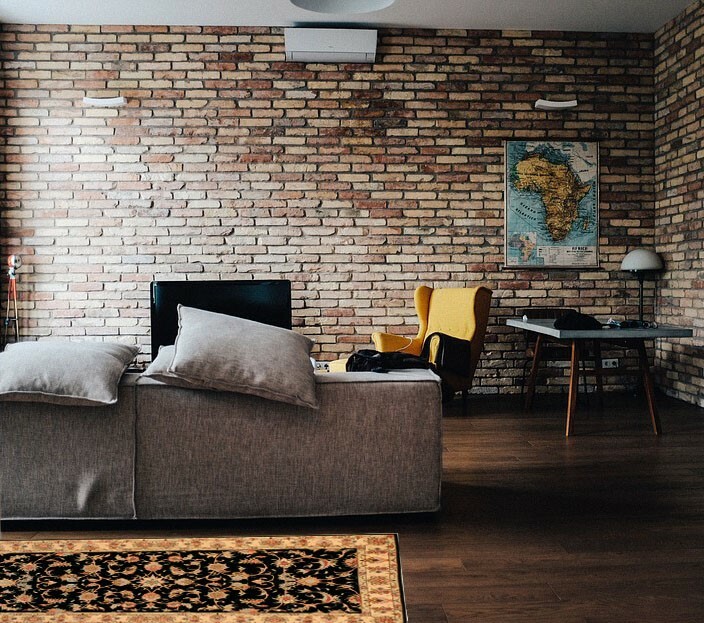 Nain rugs are cherished by rug enthusiasts all over the world for their incredibly fine weave and extraordinarily intricate and symmetrical composition. This 10 x 13’4″ rug bears all of the hallmarks of a quintessential Nain rug. Even better, it bears the signature of the Iran Carpet Company. 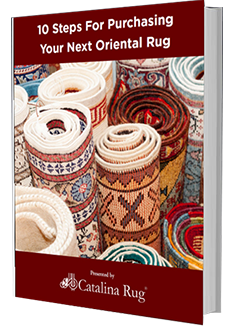 Established in 1935, this rug manufacturing company is one of the premier rug manufacturers in the region. 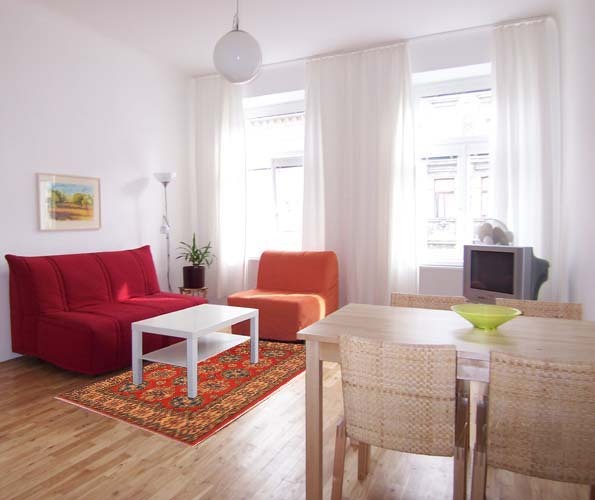 One of the major aims of the company is to obtain and use the highest quality wool and other raw materials in rug making. 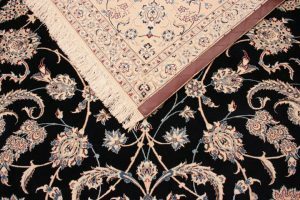 The company also introduced several other measures to ensure that all the rugs they manufactured were top notch in every way. 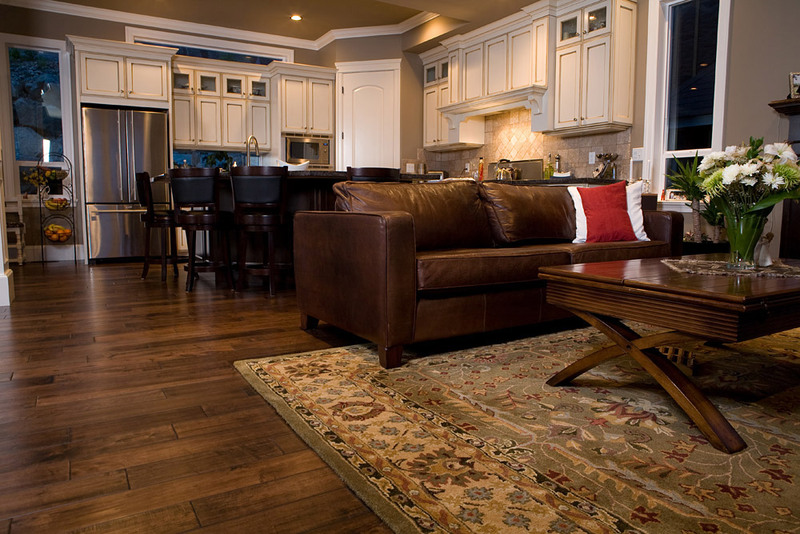 All ICC rugs have 2-ply wool, which gives the rugs increased resistance against wear and tear. Nain Rug, Signature Of Iran Rug Co.
Another unique feature of these rugs is that the weft threads are all dyed blue before they are used for weaving. This blue weft gives the rug a special look at it ages. 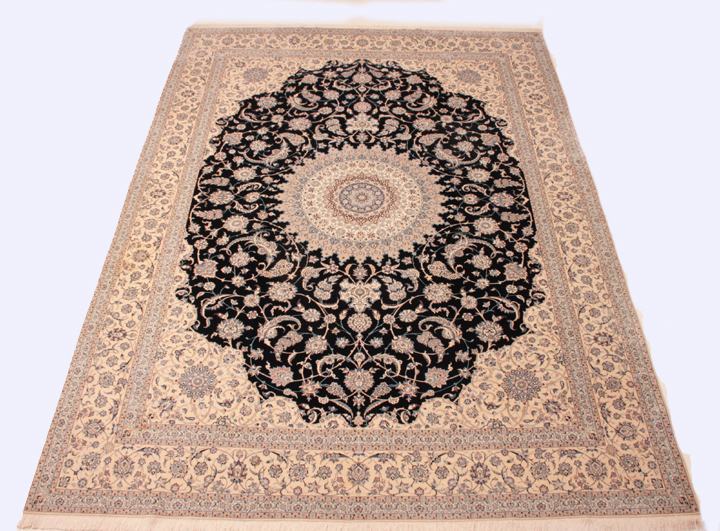 The rug has an elaborate light colored center medallion surrounded by stunning vine scrolls and Shah Abasi flowers on a black background. This is the only darker colored are in the entire rug. The border is elaborate and also light in color. 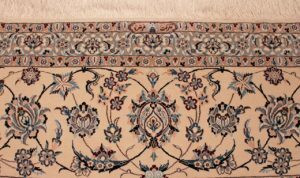 As with all rugs produced by the Iran Carpet Company, pattern and weaving of the Rug is very delicate. It has a knot count of approximately 784 KPS and it took weavers 2078 Days 18702 Hour to complete the rug. 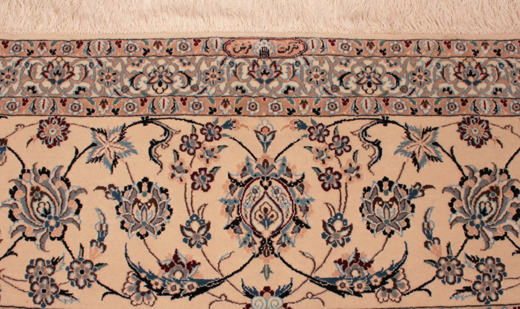 It is completely hand-knotted in the ICC workshop and the dyes used are all-natural.